The day is dreary. A perfect moment in time to do a little indoor gardening in preparation for the growing season. The coleus cuttings I took from my outdoor plants in the Autumn have thrived. 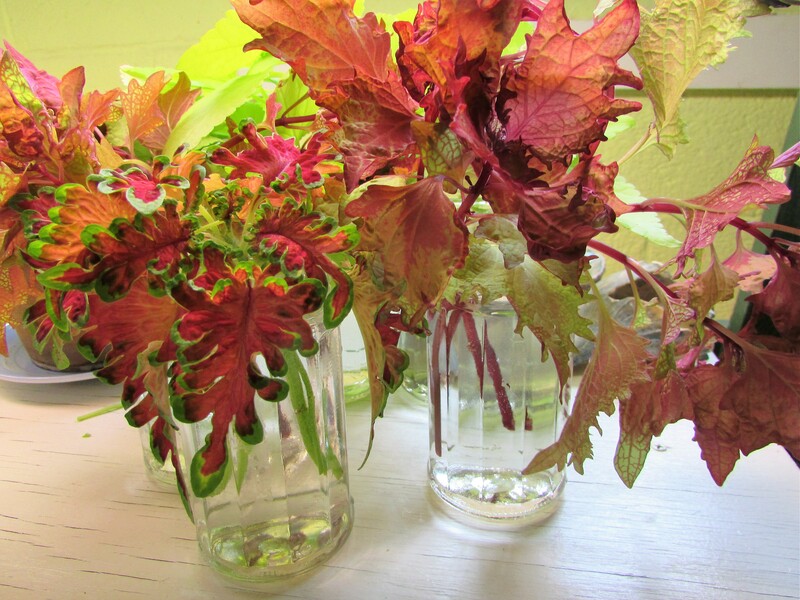 Now, it is time to take cuttings from these indoor plants, continuing the cycle of growing coleus indoors and out each year. I took several cuttings of the longest plant branches. An important next step is the removal of leaves that will be below the water line. My recycled jelly jars are the perfect size for rooting coleus cuttings. Direct sunlight is not a good idea with clear jars, but green glass is supposed to be good for rooting in direct sunlight. I placed my cuttings under a grow light, but any soft, indirect lighting will work. Within four weeks I should have dozens of roots growing from the stem. At that point I will place the coleus in potting soil and grow on in the house for a few more weeks, until the danger for frost is completely gone. Coleus will not survive a heavy frost. Thanks, usually the bunnies leave my coleus alone…but they sure chomp other things…pansy flowers, even the top of a lily once, and I thought lilies were toxic. Guess not to bunnies. They run around in bad rabbit gangs here…they are cute, but oh so destructive. Ooh, I’d forgotten about pansies. Thank you for that. I may well put the pansies in pots this year in an attempt to avoid that. Lilies? Really? Daredevil gang of bunnies you must have! I love bougainvillea. I have some, but it is not as warm in NJ so they don’t do as well as they would in Texas. Marigold are a must for me every season. I love the small yellow ones the best. I even take the petals apart and press them individually. In the very center you can find some very starry looking flower petals. Give the coleus a try. I usually have to water them quite a lot. The leaves are so thin they wilt really quickly. I think Coleus needs a lot of water too, especially in summer climes. My marigolds are not doing so well, during the spring rains or is it because they can smell summer round the corner ? I hope so, Kathy, I seem to have at least a 50 in various pots, not to speak of the 30 on the ground. My poor babies ! Oh Susie, it must be a beautiful sight! I love Coleus. I am confused about what you did with your cuttings in the autumn. Did you immediately begin rooting them? 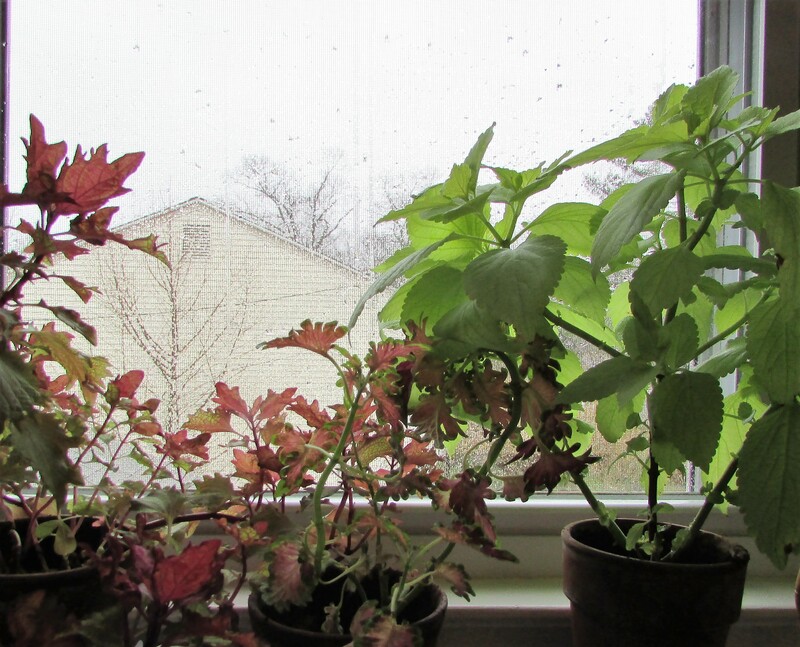 Yes, I rooted cuttings late Summer/Autumn from the outdoor coleus when I knew the temperatures were nearing a frost. By doing this I keep the same plants going year round. 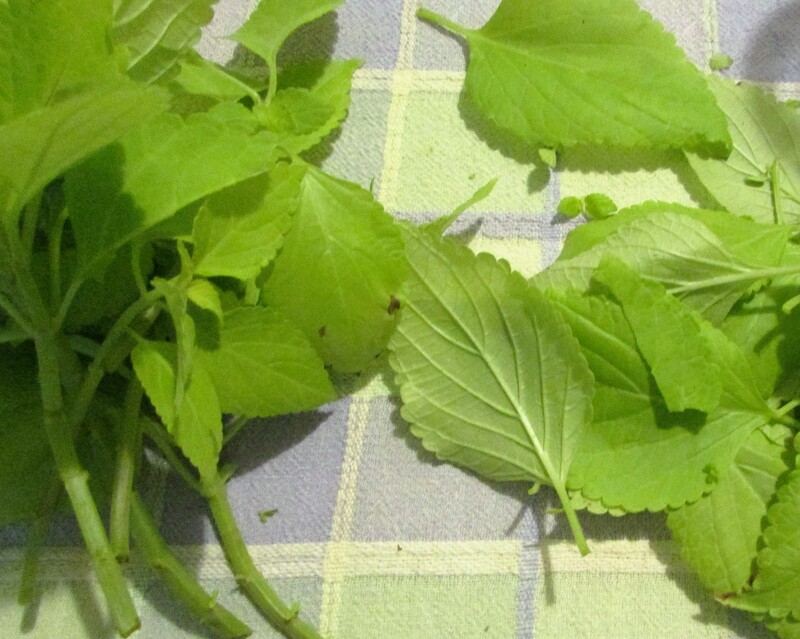 I also collect seeds from my coleus, but because our summer was slow in coming and never became very warm last year, my plants did not produce a lot of seeds. In this instance I am so very glad I saved some cuttings and will keep the same coleus growing this year. Hopefully, I will be able to take not only cuttings in the Autumn of 2016, but also will have opportunity to harvest more seeds. Coleus root so easily…one of my very favorite plants.